A neighbourhood in Patna has put up effigies for torching as part of the festive ritual of Holika dahan. 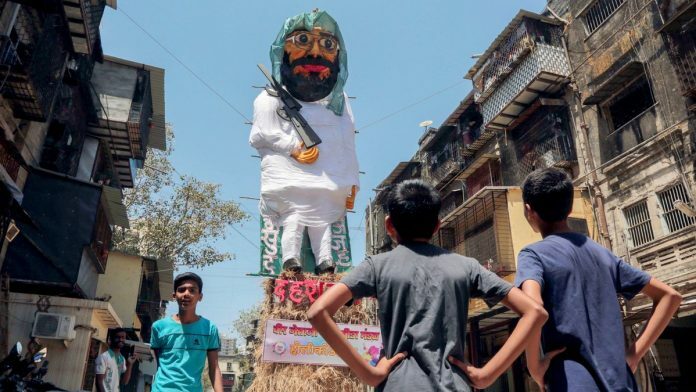 Patna: While burning ‘Ravana’ in a Holi bonfire is a common sight every year, residents of a neighbourhood in the Bihar capital this time have put up effigies of Jaish-e-Mohammed chief Masood Azhar and Mumbai attack mastermind Hafiz Saeed in the streets for torching them as part of the festive ritual. The effigies have been mounted on top of a huge pile of timber and broken twigs on a street in Kadam Kuan’s Nawal Kishor Road, and would be burnt tonight to mark ‘Holika Dahan’ or the eve of Holi. The pile faces a shop on the street side, selling colours, ‘pichkaris’ (water toy guns) and fancy masks, while an image of a jawan in combat fatigue and pointing a gun, has been put up on an electric pole in the corner of the road. “People from the local area have put effigies to show solidarity with the spirit that terror activities originating from Pakistani soil would not be tolerated by India and its people. “Pictures of both the terrorists have been pasted on the faces of the effigies,” a local shopkeeper, who did not wish to be named, said. The fresh proposal to designate Azhar under the 1267 Al Qaeda Sanctions Committee of the UN Security Council was moved by France, the UK and the US, in the wake of the Pulwama terror attack in Jammu and Kashmir in which 40 CRPF personnel were killed. A placard each have also been slung around the necks of the two effigies, bearing the slogan ‘Pakistan Murdabad’. At the bottom of the effigies a placard reading, “Pakistan this is just a trailer…”, has been kept. The message in Hindi is apparently a reference to the recent air strike by India on terror camps in Pakistan’s Balakot region that had escalated tensions between the two countries. Bonfires are put up on the eve of Holi as a part of a festive ritual to symbolically burn ‘Holika’ or perform ‘Holika-dahan’ by setting afire wood, dried leaves, twigs and other inflammable articles. In Patna, the piles, locally called ‘agja’ have been put up on various prominent roads and inner streets to mark the festival. State pollution authorities have appealed to people to not burn plastic objects or polythene bags as part of the bonfire.